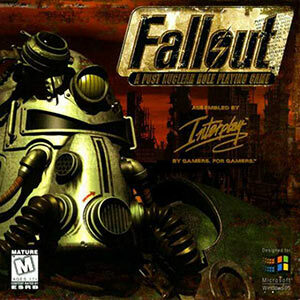 The Fallout video games series (1997-present) takes place in an over-the-top post-apocalyptic setting. It mixes a Mad Max aspect, 1950s atomic horror conventions and various “after the Bomb” influences. For a primer, see our sample Vault Dweller (the Player Character in the first Fallout game). DC Heroes players can also refer to the generic deathclaw entry for scale explanations. 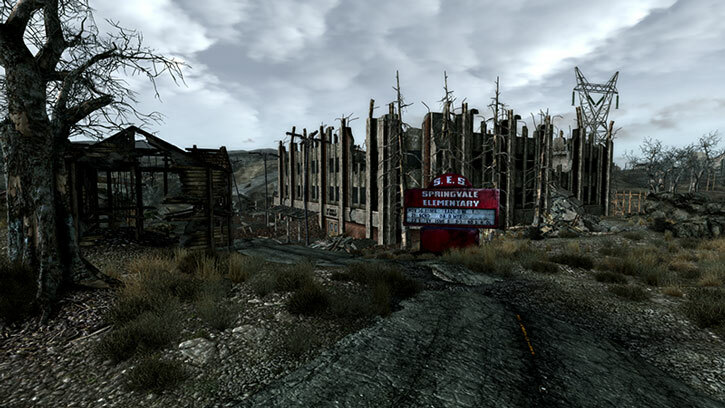 The goal of this article is to provide game stats for weaponry that is unique to the video games Fallout (with FIXT changes), Fallout 2 (with restored content) and Fallout 3 (with a mods suite centred on the Wanderer Edition ). The possible in-universe role and origin of some weapons for which no context is provided in-game. The distribution and availability of weapons in the Fallout universe. Considerations about firearms in a post-apocalyptic setting. The weapon sprites were taken from fallout.wikia.com . Extracting them ourselves to get the exact same results would make little sense. They have been kept to a small size, since enlarging this sort of low-res image is a recipe for disaster. Most of the photos come from the IMFDB , as with most of our guns-centric Weapons Locker article. This article uses a few technical terms about guns. If you’re not knowledgeable about these, our Old West guns article starts with a short primer about this vocabulary. This article is presented in “episodes”, and will only gradually reach its full span. We upgrade it when we work on our Fallout articles, which are now mostly about the first two, isometric games. The most common weapons in Southern California in 2161, the setting of the first Fallout game, seem to be primitive melee weapons. Common ones are spears, knives and brass knuckles. Tribals are usually limited to these weapons. The next “tier” are professional non-tribal fighters. These may have a 10mm pistol and possibly a submachinegun – plus a melee weapon to save ammunition. Such persons are often raiders, caravan guards, gang members, militiamen and the like. Successful persons in these occupations will also get some leather armour. If they have metal armour they are presumably very successful, and/or leaders. Junior raiders, guards, etc. may have to do without guns and use a good melee weapon instead, such as an axe. Hopefully the fire from their better-off colleagues will provide some cover. The full-time police/militia of powerful communities may have armour up to combat armour, and weapons such as shotguns and semi-auto hunting rifles. The main example is the enforcers at the Hub, which is the largest community of the original Fallout setting. Anything heavier than that — say, assault rifles or sniper rifles — is normally encountered in the hands of successful mercenaries and adventurers. These are expensive and difficult to obtain, and ammunition (usually .223) is chiefly found in well-stocked places such as the Hub or the Gun Runners’ fortress. High-level mercenaries and adventurers might even have energy weapons. Organisations that have access to wartime military weaponry are the Brotherhood of Steel, the Gun Runners and Unity (aka the Children of the Cathedral). Belonging to such an organisation marks a big leap as energy weapons, miniguns, flamers and the like become available. Combat armour will also be available (though the Children of the Cathedral prefer wearing robes), and the Brotherhood has access to power armour . These organisations thus have *way* more firepower than what is normally found in the wasteland. The Capital Wasteland, the setting of Fallout 3, seems more heavily-armed. The lower tiers of fighters, such as junior raiders (see our entry about Capital Wasteland Raiders) will still have but melee weapons such as knives, bats and hatchets. However, their more senior colleagues can be expected to have a decent mix of small arms – small- and medium-calibre pistols, side-by-side shotguns, submachineguns, etc. Everyday conflict in D.C. is more likely to be a gunfight than in California. Likewise, fighters backed by an established community will have combat-grade firearms. 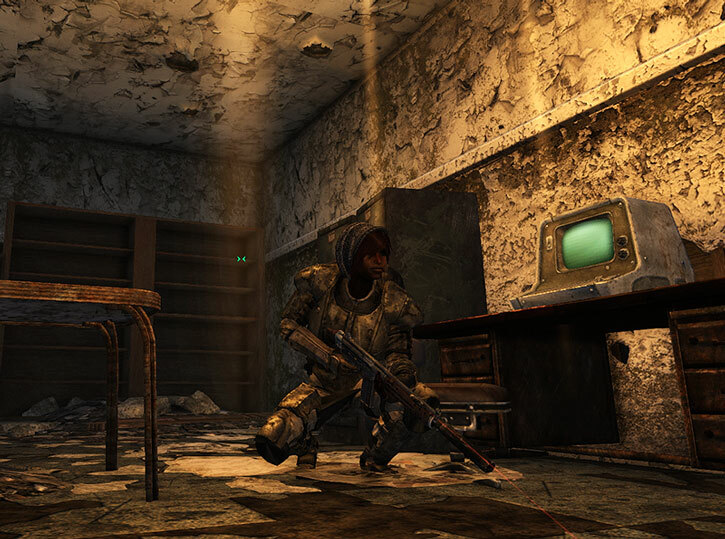 The enforcers at the small village of Megaton have assault rifles and marksman’s rifles in good condition. Top-shelf fighting forces such as the Talon Company will have combat armour and all sorts of combat-grade firearms, plus a smattering of heavier weapons and energy weapons. As in California, the highest rung of the ladder is those few organisations who still have access to beforetimes technology. These are the Brotherhood (regular and renegades) and the Enclave. Their fighters have power armour, heavy weapons, plasma weapons, etc. and are the 800 lbs. gorillas of the setting. Fallout is an odd milieu where you can have a guy with an ax, a guy with a .45 submachinegun, and a guy with a plasma rifle and power armour walking into a bar. Even within a given niche, such as a medium calibre pistol, one will find everything from near-future weapons (the ubiquitous Colt 6520) to weapons from the XIXth century (Gizmo ’s Mauser). One can rightfully wonder how weapons from such different technological levels can coexist in a single area. Why are there still a bunch of 1950s guns around in the (modded) Capital Wasteland if the basic pre-apocalypse sidearm was the Colt 6520 ? As it turns out, this is not *that* strange. Technological progress can see huge accelerations in wartime. The typical example is World War Two which, to oversimplify, saw biplanes (such as the Swordfish ) at the beginning and saw jet fighters (the Me 262 ) at the end. The weapons used on the frontlines could easily be way more advanced than what is used back home, or than what is issued to fighting forces not backed by a huge military-industrial complex. During previous areas of vast changes in weapons technology, different generations of weapons were routinely coexisting. For instance, during the US Civil War, most soldiers were still armed with rifled muskets while some of their colleagues had lever-action repeater rifles (think Winchester). See our Old West guns article for more about this. There are indications that firearms were beginning to be phased out when the war erupted. Such a shift in armament would indeed be a lengthy and hugely complex project as supplies chains, other logistics, technological training, weapons training, etc. would have to be fully reengineered to deal with very different weapons. Such an endeavour could easily take 10 years, and decades for reserve units. Thus, having most soldiers with assault rifles while specific units have lasers is unsurprising, especially as logistics during a war will have to be modified piecemeal. 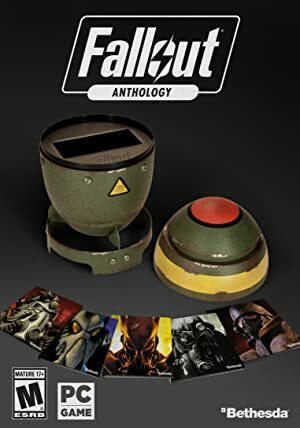 The world of Fallout is established to have a very conservative streak (it stuck with 1950s aesthetics and social mores, long after the 1950s ended), and subtly different physical laws affecting electronics. People might thus doggedly stick with tried and true weapons tech from decades ago (true Americans shoot nothing but .45 ACP and .30-06 rounds ! ), and the high tech stuff such as power armour and plasma rifles might run into production constraints that wouldn’t make sense in the real world but limit the quantities that can be produced. Many of the weapons seen in the game might have been produced after the apocalypse. In such a setting, producing WWII-era firearms makes good sense. These are simple, tried and tested, relatively low-tech designs that are easily produced and used. A Sten submachinegun can be built with very little and you can find the blueprints in gunsmithing history books. It is probably much easier to build one than a near-future H&K MP9. Thus, many mid-XXth century weapons seen in the modded Fallout 3 are probably not antiques, but the products of post-apocalyptic weapons manufacture. The distribution of arms in Fallout has a strong “levelling up” logic to it. Characters effectively unlock better weapons as they progress. Once you’re tough enough to kill a guy with a pistol, you have a pistol. Furthermore, there is a ratchet effect. Once you have a submachinegun, ordinary radscorpions and guys with machetes are suddenly much less of a problem than back when you had but a spear. Thus, tribal matters stop being a challenge. There is now a large swathe of the setting that you are out-gunning. This also has an impact on training and skills sets. Experts who have spent years training with spears and fire axes see all this work of theirs obsoleted once they have a gun. So do pistoleros who get access to a high-end, heavier weapon such as a plasma rifle. Embrace this and have the characters clearly move to a higher tier of opponents as their firepower increases. You can even have just a “training montage” sequence to have the characters now be proficient with the new tier of weaponry at no cost. The Fallout games sort of, kind of do this by having an open world, but one in which there are clearly higher-level areas and with the “quests” encouraging the characters to follow a progression from lightly armed areas to heavily armed areas. De-emphasis the levelling-up logic, and have the characters sometimes use melee weapons, sometime use pistols, etc. The slickest way to do this is a greater focus on technical issues, which this article will discuss next. Unmodded Fallout games do not feature bows or crossbows. In low-tech games (say, with tribal Player Characters) or in games where firearms are difficult to use, an absence of archery would be incomprehensible. People will undoubtedly equip themselves with such weapons. DC Heroes players can check our article about bows in DCH for more. 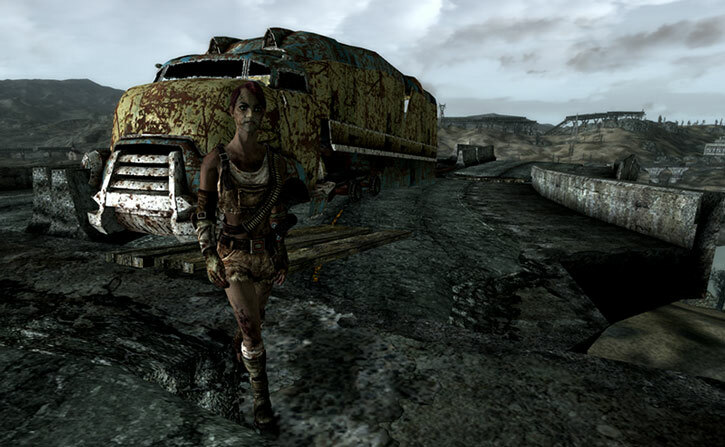 Fallout heavily draws from previous post-apocalyptic stories, for instance the Mad Max movies. Thus, upon first contact with the original Fallout isometric view games, many players expected ammunition to be scarce and hard to manage, like in Mad Max films. As it turned out this is not the case. A typical Fallout playthrough will leave the player swimming in ammunition and energy cells. Role-players may be interested in having their Fallout game feature ammunition scarcity. Beyond making things grittier and harder, it helps with flattening the “levelling up” video game logic. You may have, after much struggling, secured a .44 magnum revolver. But if you have only three rounds of ammunition for it (as the Lord Humungus did) and you can’t be sure that they will actually work, you’ll still be using your machete-on-a-stick for most fights. Since Fallout games do not actually feature ammunition issues (except for a heavily-modded Fallout 3) we will not be providing technical material on the subject. But here is a primer (he he) for those players and GMs who aren’t gun nuts. The first steps in such a setting are obvious. Lower the quantities and quality of weapons available in shops and from defeated/robbed NPCs. Note that combatants with burst-capable weapons will adapt by using semi-automatic fire most of the time, which must be supported by guns stats. The second step is to emphases the variety of rounds. If your good pistol shoots 9x19mm ammunition and the guys you’ve just killed used a dated mix of .32 ACP semi-autos and .38 Long Colt revolvers, you’re not swimming in ammunition you can use. Carrying the least-damaged-looking .32 ACP Browning they had to make use of the ammunition you found and spare your stock of 9x19mm rounds. However, there are only so many weapons you can carry and learn to use. And/or carrying away and bartering the ammunition you found with a guy who has 9x19mm rounds but is interested in other calibres. And/or using specialised skills and equipment to extract and repackage the gunpowder, melt the casings and bullets and manufacture new rounds in 9x19mm. Being able to do this in a post-apocalyptic environment is a pretty tall order, but a reputed Fallout 3 mod does exactly this. Likewise, your laser rifle might use J33 power cells. But the carbines used by the enemy might run on K37 power cells that cannot fit into your rifle. Of course, this approach means much more book-keeping ! The third step is to get technical about ammunition quality – just like Mad Max scrounged shotgun shells that didn’t work when he tried to fire them. Reduced accuracy of the round at a range. This should be a common feature of poor ammunition, and might make shots past 30-40 metres unworkable even with a rifle. Inert ammunition (probably a defective cap). The action needs to be worked to eject the inert round. Delayed fire (probably poor powder). Looks like an inert round, but will fire a few seconds later if it has not been ejected by the shooter. A “stovepipe” where the empty casing gets stuck in mid-ejection and needs to be pried out. Poor loading from the magazine. A double feed (the first bullet doesn’t fire, the shooter presses the trigger again and there are now two rounds jammed in the gun and magazine). Complex stoppage – the round jams badly. It can only be cleared by taking the gun apart and cleaning it. Perhaps the casing split open, or the powder caught fire rather than explode, or much of the powder didn’t explode and the bullet only went a few centimetres before getting well stuck in the barrel. Insufficient power. The round has a significantly reduced range, accuracy and power. Furthermore, it doesn’t give off enough energy for a semi-automatic weapon to automatically load the next round. After the weak shot, the shooter must realise the need to work the action manually. Likewise, most weapons in Fallout are either very old or built using post-apocalyptic manufacturing. And the game does feature them suffering from use and having to be regularly repaired. Decay of accuracy, for instance as powder residues accumulate in the rifling due to lack of maintenance. Or the rifling gets worn from age and use, or the iron sights get out of alignment. Maintenance getting ever longer and fiddlier as the components get worn. Rapid increase in the frequency of jams, directly tied to the sophistication of the action. A side-by-side shotgun will work fine until the hammers or the trigger mechanism break, but stoppages on a semi-automatic or automatic weapon are going to become frequent. Between bad weapons and bad ammunition, one will quickly end up in a situation where more time is spent clearing stoppages than shooting. A narrower range of ammunition can be used. Stronger powder charges will gradually become too risky to use, and the components wearing down may mean that some brands of ammunition may lead to too many problems with this specific weapon. Frex, one might end with a pistol that remains semi-reliable only if fed ammunition with a certain type of casing and a subsonic powder charge (normally intended for suppressed firearms). Furthermore, it will be difficult to determine which weapon will reliably fire what. Even brand-new guns have limitations about what sort of rounds they will reliably fire. But in a post-apocalyptic environment you will probably not have access to the manual and the effective specifications of the gun will have changed due to age anyway. Even a newly-built gun might have unpredictable issues as to which ammunition it can shoot, caused by poor metallurgy and/or loose manufacturing processes. And systematic tests using a variety of casings hand-loaded with increasing loads of gunpowder and a variety of bullets may not be possible in a milieu where ammunition is rare to start with. The gun may eventually end up falling apart. Or explode under the pressure of firing too strong a round. A related issue, for weapons using “clips” (removable box magazines) is poor feeding. This is often due to a weak spring that doesn’t push the bullets up hard enough – or the top of the magazine not aligning and locking well with the gun. Clips degrade with age. Thus, finding good ones (or finding the supplies and having the expertise to repair bad ones) could be a major problem. Keeping and maintaining good clips could be critical. As a result, other types of repeater firearms such as pump-action or lever-action could end up being a safer alternative if good clips can’t be found for the team’s clip-fed firearms. This would also explain the wide variety of weapon types floating around, as there aren’t enough good clips left to feed semi-auto guns. Though a misfeed is the more typical problem, having a box magazine fall off can also happen if it’s very old and/or badly manufactured. Or if the gun is very worn or damaged. Early Fallout games had noticeable issues in deciding whether they stick to 1950s-inspired aesthetics, or go for near-future designs. 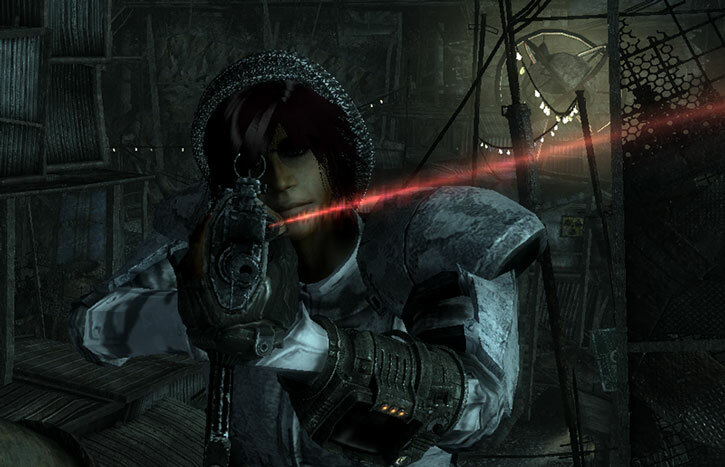 The issue receded starting in Fallout 3, with a retrofuturistic design that continued to gain in coherence. Presumably, the art direction and concept art manpower got larger. 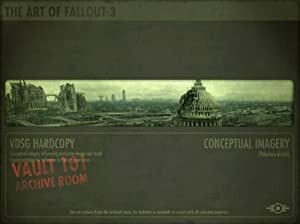 Thus, we’ll use illustrations and concept art from the most recent game (Fallout 4, as of this writing) while the bulk of our research is still about content from the early Fallout games. The Fallout universe sees significant use of low-tech melee weapons. Most of these weapons are scavenged from the ruins – such as steak knives, fire axes or police batons. Or they can be built with very limited means (such as brass knuckles, spears, or even just sharpened long sticks. Sharpened long sticks are great compared to one’s bare hands). Most of these weapons work exactly like the ones in our Weapons Locker – Melee Weapons articles. Though the game can only feature a limited number of melee weapons, there are probably numerous types in use in the setting. Weapons requiring a lot of blacksmithing knowledge and that cannot be readily scavenged — primarily swords — are not going to be common. But some are presumably out there – if only high-end replicas from the beforetime. The following Fallout melee weapons are worth specific notes. The Big Frigger produced by BeatCo is a large metallic gauntlet powered by high-tech batteries. What it actually does is unrevealed. Maybe it emits an electrical shock on impact, or — more likely — there is a heat-based plasma release when it hits. The damage from the power fist is equivalent to being hit by a rifle round (somewhere between the hunting rifle and the sniper rifle). Why would such a weapon exist on the modern battlefield is unclear. It is possible that on some battlefields of the War hand-to-hand combat did occur, perhaps in circumstances similar to some WWII battles in the jungles of Pacific islands, or the Việt cộng tunnels during the 1970s. If so an add-on to power armour gauntlets that doesn’t hinder their ordinary use would have been a just-in-case asset, appreciated if only for psychological reasons. A Power Fist could also be an entry weapon – that is, something to bash doors open during SWAT operations. Shotguns with specialised rounds are usually used for that in the real world, but it’s not absurd to imagine that a Power Fist might be better and safer, depending upon how it works. DCH Power Fist [BODY 06, EV 06, Ammo: 25 (Long Reload Time)]. M&M Power Fist [Close Damage 5, select a Descriptor based on what Power Fists deliver on impact in your campaign]. A rare, upgraded model — the mega power fist — also exists. It is more powerful, but eats up power at twice the normal rate. DCH Mega Power Fist [BODY 06, EV 06, Flame project: 05, Ammo: 12 (Long Reload Time), Limitation: Flame Project has No Range but is Combined With EV]. M&M Mega Power Fist [Close Blunt Damage 5, Close Plasma Damage 4 (Linked with Blunt Damage), Quirk – eats up batteries at twice the normal rate]. Starting with Fallout 3, power fists are explicitly portrayed as an hydraulic ram plate device, reportedly used for demolition work. What happens to the user’s forearms, given Newton’s third law of motion, isn’t entirely clear. This version would have roughly the same stats, but inflict blunt impact damage. An electrified baton. These are almost certainly modified, since getting hit by one of those in-game is more than twice as bad as being hit by the best-quality combat knife – and comparable to being hit by a high-power handgun. Actual cattle prods do not work like that, and though the flavour text presents this as a farmer’s tool they might be police or military issue. Cattle prod are powered by energy cells, which can only deliver so many shocks before running dry. It is possible that these weapons were issued in some police departments in a political move to look tough in the face of real or imagined Communist sympathisers. This builds on the very strong association of cattle prods with authoritarian anti-Communist governments during the Cold War, particularly in Latin America. DCH Cattle prod [BODY 03, Lightning (No Range): 05, Ammo: 20 (Long Reload Time)]. M&M Cattle prod [Close Electrical Damage 4]. 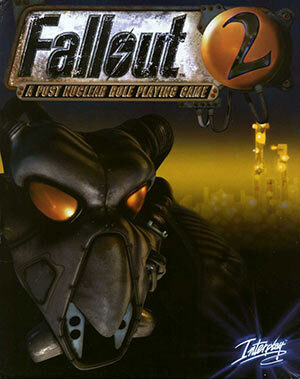 Fallout 2 has super cattle prods, whose attack power is higher by one AP or Rank. These can be built from an ordinary prod by a gadgeteer in New Reno, but some Enclave soldiers carry an equivalent weapon. Though it’s called a “vibroblade” in the game, this is actually a chainsword with the length of a large knife. This technology is similar to a chainsaw, with a figurative chain driving claw-like blades to buzz and tear through whatever it is applied against. The mechanism has to be especially reinforced to handle the vagaries of combat, which are very different from applying a chainsaw to a tree trunk. A ripper is the second most devastating close-combat weapon in the game and is powered by energy cells, though these will run dry fairly quickly. Why such a weapon would be developed isn’t obvious. One possibility is that it’s actually an utility tool for some infantrymen and combat engineers. In ravaged urban environments or forests, having a mini-chainsaw that is tough enough to rip open interior walls, automobile bodies, thick wood, permafrost, etc. could definitely be useful for shelter, removing obstacles, improvised fortification (or at least cover), etc. It could be issued by the Chinese military, which in the real world has been known to do some weird things with its entrenching tools. DCH Ripper [BODY 03, Claws: 06, Ammo: 30 (Long Reload Time)]. M&M Ripper [Close Slashing Damage 5]. 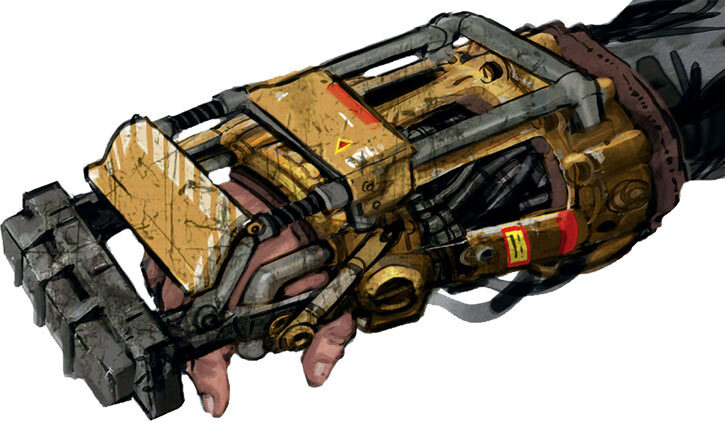 This nice Fallout 4 concept art also evokes a battlefield utility tool. This high-tech sledgehammer is the most damaging close-combat weapon in the game, and was built by the Brotherhood. It uses a technology that stores kinetic energy and releases it on impact. But many player imagine it as the sledgehammer with an improbable rocket booster seen in Battle Angel Alita (a.k.a. Gunnm). Unlike the previous weapons, it doesn’t need additional batteries to keep running. This weapon’s niche is unclear. In-game it’s explicitly there to give melee characters a high-powered weapon, much like the power fist is there for unarmed combat characters to be viable. In-universe, since it is reliable and ammunition-free, it might be used to engage dangerous animals such as caverns full of radscorpions. 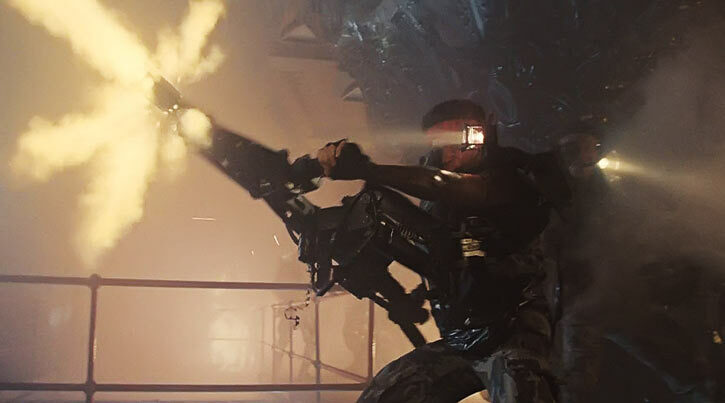 Most radscorpions cannot threaten a person in Brotherhood power armour so wasting valuable ammunition or energy cells on them would be pointless, and the Brotherhood might consider that killing animals with a large hammer builds up muscle and aggression in its initiates. Or perhaps the Brotherhood does a lot of manual demolition work for some reason – perhaps simply because it’s a good, macho-looking exercise. DCH Super-Sledge [BODY 05, EV 06, Stagger: 07, Bonus: EV and Stagger are Combined]. M&M Super-Sledge [Close Blunt Damage 5, Close Affliction 6 (Dazed/Prone, resisted by Dodge, Limited Degree, Linked to Damage]. In Fallout 4, the super-sledge explicitly uses a rocket engine, which triggers when a certain velocity is achieved. In this bit of concept art you can clearly see it in the back of the head assembly. Mutants & Masterminds player should likewise consider Flaws such as Unreliable, Diminished Range, Check Required… depending upon the damage. Quirks can also be handy. If you’re unfamiliar with some of the firearms lingo used therein, our Old West Firearms article includes an efficient primer (he he) about this stuff. In both DCA and DCH, burst-capable weapons are assumed to fire in bursts. But in a setting with scarce ammunition, people will shoot semi-auto to conserve ammunition, and quite possibly to lower chances of jamming. Burst fire will be reserved when tactically necessary, or desperate. In DCH, firing semi-auto will lower the R# by one in most cases. On some weapons with a high R# caused by age, poor maintenance, etc. the R# reduction may be higher, reflecting a battered gun that’s vaguely reliable when shot semi, and will likely jam if shooting a burst. In DCH, you have to adjust how to count ammunition and in DCA, you have to start counting ammunition. Here is an example of Ammo adjustment in DCH. A typical submachinegun is listed with Ammo: 07 in DCH terms, and most come with a 30-round detachable box magazine. Which means that the ammunition consumption is about 4 rounds of ammunition per burst (4*7=28, close enough). So if allowing for semi-auto fire, the new Ammo value is 30, a semi-auto attack costs 1 Ammo, a burst attack costs 4 Ammo. Simply use similar values for DCA. DCA doesn’t normally count things that way, but here managing your small stock of ammunition is the whole point. On the other hand, a one-point difference in DCA will be barely noticeable due to the swinginess of the d20. That’s a recurrent problem. Three-round bursts were an important innovation in infantry combat. You set your weapon’s fire selector on that, and each trigger squeeze will spit out a burst of three bullets – no more, no less. It is a sort of sweet spot between controlling recoil, not wasting ammunition, optimising your chances of hitting the target, encouraging aiming, etc. DCH Ammunition values for burst-capable weapons in our Weapons Locker article assume mostly 3-round bursts, with one or two longer bursts thrown in. The latter reflect the common use of burst fire in movies, games, etc.. Of course, this doesn’t come into account for weapons without such a mode (like machineguns). Neither DCH nor DCA is the right system to make fine-grained distinctions between fire modes, though. So let’s just ignore it. The main example of this is the pipe rifle in early games, illustrated below. FO2 also had a zip pistol, though it wasn’t in the finished game. Zip guns — home-made firearms — certainly should be a thing in a post-apocalyptic environment. They can be an important rung on the ladder toward real firearms, especially for tribal and rural characters. Conveniently, we now have a full article on home-made and improvised firearms you can peruse. Homemade firearms have more of a presence in later Fallout games, especially FO4. The standard medium-calibre semi-auto pistol. In early Fallout games it was the Colt 6250. However, the icon was clearly based on firearms seen in the Hard Boiled comic books, which are enormous. This size doesn’t match the performance of this baseline weapon. Use the medium-calibre semi-auto pistol stats from the Handguns article. An alternate approach would be that the huge size of the 10mm pistol before FO4 (how are these things even aimed ?) corresponds to a lot of power. But that doesn’t match the observed performance in-game, even with mods. And of course the damage from the 10mm round is markedly less powerful than .44 rounds in all Fallout games. This is often a favourite sidearm for Fallout 2 Player Characters with the Small Guns skill tagged. However, its robust characteristics mean it gets used to rapidly chain aimed shots at close range, which is… not what you’d expect from a large-bore wheelgun, especially compared to the basic medium-calibre semi-auto. In an attempt to make sense of this, our sample Chosen One writeups (particularly chapter #2 and #3) assume a unique weapon with lots of made-up customisation, to lower the suspension of disbelief. This explanation also rests on the fact that this weapon is usually customised by a gunsmith relatively early in the game. While a few Non-Player Characters also have a .44 revolver, this is rare and we can reasonably close our eyes and pretend very hard these have more sensible stats for a .44 magnum revolver. This weapon’s description makes it sound much like a dart gun, like those used to tranq large animals at a range. It also has a quiet sound. However, the stats of the needler gun make it a devastating sidearm. For instance it’s much better than the .44 Desert Eagle, and it has devastating armour-piercing ammunition to boot. The needler pistol also inflicts normal damage, rather than poison damage. Another nail in the coffin of the notion that it injects some sort of super-toxin. Our No-Prize Hypothesis is that the needles have a binary delivery system. That is there are two compartments for the payload, separated by a fragile divider. The two liquids within get mixed and injected upon impact. Such a system makes it safe to dose the chemicals in the field without, say, exposing the veterinarian to tranq fumes. Since the solution only gets mixed on impact. Such a system could trivially be hacked in the Wasteland using small quantities of liquid binary explosive compounds. Same general principle, except these cinematic chemicals react to each other by detonating rather than by forming a knock-out drug. It also explains why the armour-piercing needles are so strong – the explosion takes place deeper within the target. The needler pistol primarily appears in Fallout 2, and is more likely to be first encountered in the hands of evil kid genius Myron. And it certainly seems like the sort of weapon he’d wield, tailor-made for his skills, low strength and characterisation. Based on the precedent of the .223 pistol, one suspects that the needler pistol was originally designed as a weapon specific to Myron. And that later on it was thrown into the general equipment tables for NPCs, to fill out their choices of handguns and to have needler ammunition drop from generic opponents. So let’s have two options. The explosive one as described above, where needlers are a not-uncommon choice of high-ish end handgun. And the toxic one, with a scientific expert brewing their own batch of super-poison. DCH Needler pistol (generic option) [BODY 02, Projectile weapons: 05, Sharpness (Projectile weapons): 01, Ammo: 10, R#03, Thief (Stealth): 01, Limitation: Thief (Stealth only to muffle the shot)]. DCH Needler pistol (Myron option) [BODY 02, Poison touch: 05, Range: 04, Sharpness (Poison touch): 01, Ammo: 10, R#02, Thief (Stealth): 01, Limitation: Thief (Stealth only to muffle the shot)]. M&M Needler pistol (generic option) [Ranged ballistic Damage 4, Feature 1 (suppressed)]. M&M Needler pistol (Myron option) [Ranged toxic Damage 4, Feature 1 (suppressed)]. A super-handgun with smashing game stats. In Fallout it is a one of-a-kind, artisanal contraption that gives the Vault Dweller a solid tactical edge. This aspect is played up in our sample Vault Dweller character profile, with further adaptations to fit the weapon to the shooter. See these profiles for more about this gun. 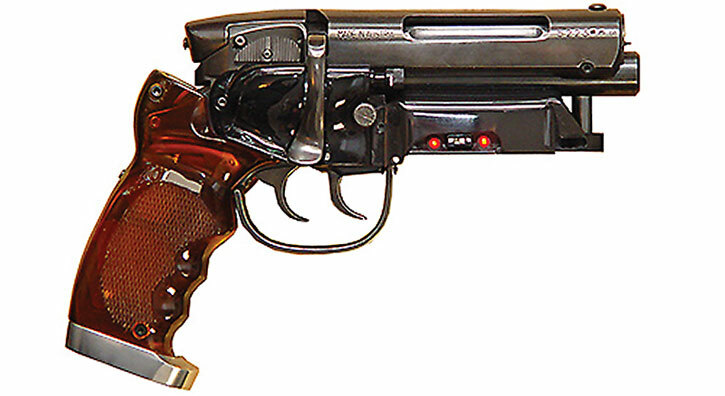 The weapon’s icon is the pistol used by Deckard in Blade Runner, which has memorable visuals. In Fallout 2, the weapon inexplicably stops being unique, and is thrown willy-nilly into the level-appropriate inventories for merchants and generic opponents. Since this breaks this weapon’s mystique, our suggestion would be to ignore that and pretend these weapons are M4-style .223 carbines without a stock, firing in semi-auto since they are too old and would jam if firing bursts. DCH .223 handcannon [BODY 03, Projectile weapons: 06, Range: 04, Ammo: 05, Rec. STR 02, R#03, Limitation: Projectile weapons has no Range, used the listed Range]. M&M .223 handcannon [Ranged ballistic Damage 5, Diminished Range 1]. DCH Aged M4-style shortened carbine [BODY 02, Projectile weapons: 05, Ammo: 30, R#04]. M&M Aged M4-style shortened carbine [Ranged ballistic Damage 4]. The gauss is an old unit of magnetic flux density, named after the mathematician . By metonymy it gets used as a name for railguns. Railguns are weapons that use extremely intense magnetic fields along a rail to shoot a projectile at an enormous speed. During the war, M72 Gauss rifles bought from an unspecified German producer were issued to snipers in elite units. They were the ultimate in long-range precision shooting. Gauss rifles offered extraordinary ballistics, very low recoil and muzzle flash, modest noise, good optics… and shot 2mm EC rods with exceptional armour-defeating power. They were a hard counter to power armour infantry. A gauss pistol also exists. Our sample Chosen One character profile assumes that it is a conversion from a gauss rifle, perhaps as part of a binning process. In any case, it is pretty much the ultimate semi-auto short-range weapon. DCH Gauss pistol [BODY 02, Projectile weapons: 06, Range: 05, Ammo: 12, R#03, Thief (Stealth): 01, Limitation: Projectile weapons has no Range, used the listed Range, Thief only to muffle the shot]. M&M Gauss pistol [Ranged ballistic Damage 5]. DCH Gauss rifle [BODY 02, Projectile weapons: 08, Ammo: 20, Telescopic vision: 03, Thief (Stealth): 02, R#03, Limitation: Thief only to muffle the shot]. M&M Gauss rifle [Ranged ballistic Damage 7, Senses 1 (Extended Visual)]. See our Heavy Weapons article for general considerations about these. A 28 pounds weapon firing what seems to be one of the most common assault rifle ammunition. 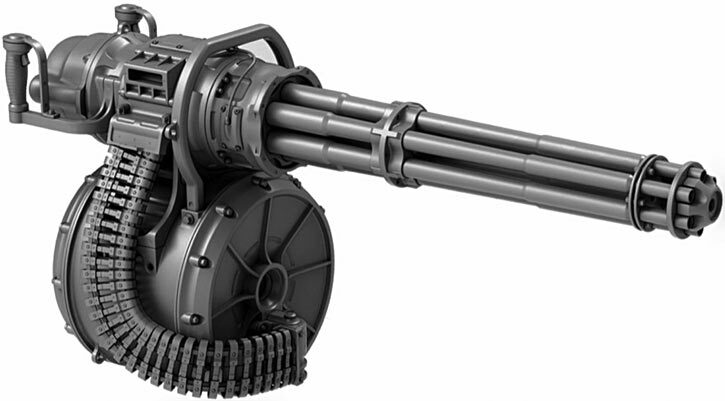 This minigun features six barrels, and either a 120-round or 240-round ammunition cage depending on the revision. Later models could also be connected to an ammunition backpack. Obviously this weapon is intended to be used by power armour infantry, though one imagines that some vehicles may have pintle-mounted this. However it was in the process of being replaced by a more modern models using more specialised rounds. After the War, it also turned out to be entirely useable by most super-mutants created by the Master. The stats for the Man-Portable Minigun in our Heavy Weapons article fit, but raise the necessary Strength by 1 in both DCA and DCH. In DCH, the Ammunition capacity is 3 or 6 depending upon the size of the ammunition cage, and rises to the standard 10 with the backpack. In Fallout 2, the damage-per-round of this weapon is lowballed for game balance, to about the level of a 10mm pistol shot (!). This interacts badly with FO2 damage threshold mechanics, the result being that this weapon clearly under-performs against heavily armoured targets. Outside of FO2’s haphazard combat system it is difficult to justify 5mm rounds suddenly becoming less powerful when shot from a minigun than when shot from an assault rifle. But one possible approach is to have a limitation preventing this weapon from doing Power Attacks (DCA) or Critical/Devastating attacks (DCH) unless used at very short ranges, because the shots disperse too quickly. This is only slightly awkward, and is a decent nod toward the two downsides of the CZ53 in FO2. 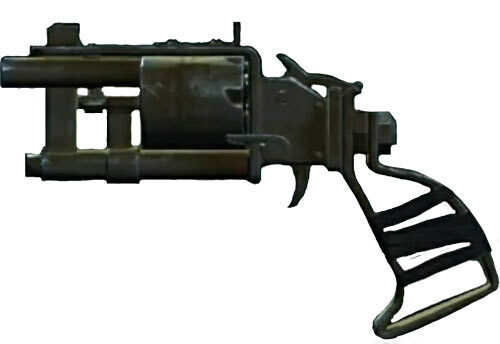 The 3D model for the minigun in Fallout 4, for which no model seems to be listed. What *is* a Bozar ? We don’t know either. The best bet is apparently that it was meant to be some sort of anti-materiel scoped rifle. But it (accidentally ?) ended up shooting 5.56mm full bursts and was kept that way in the game. So it’s some sort of, errr, marksman’s squad support weapon ? whose bursts get shot with a single bang. a 5.56mm squad automatic weapon broadly similar to the Minimi, but modified (in particular it has no pistol grip, no stock, and an electric trigger). a rigid harness and a stabilised bearing arm quite similar to those of 1980s Steadycam TV video cameras. combat optics mounted on the receiver, parallel to the barrel. a light headset with a monocular sight, plugged into the harness which it then plugged into the optics. This feeds the video from the gun sight, reticule included, to the eyepiece. The stabilised mount would be lighter than the one in the movie, and a huge wielder (such as a super-mutant) would be able to do without (though the headset would also have to be adjusted, unless they have a very small head for their size ). So this leaves us with an accurate, scoped, long-range 5.56mm machinegun. Mission bloody accomplished, and it matches with the Aliens references already in the game. We can further hypothesise that it has an extremely high cyclic rate, shooting a 15-round burst so quickly the report from individual shots all blends together. DCH Bozar [BODY 03, Projectile weapons: 08, Ammo: 10 (02 without a backpack bin), Telescopic vision: 02, R#03, Recommended STR 03 (01 when using the harness and bearing arm), Advantage: Autofire, Drawback: Long Reload, MPR (heavy and cumbersome – cutting movement speed by 1 – unless your STR is 1 APs above the Rec. STR]. M&M Bozar [Ranged Multiattack ballistic Damage 6, Takedown 1, Senses 1 (Extended vision), Quirk (cumbersome unless your STR is 4+ so you can go without the harness and mounting arm)]. In Fallout 2, the per-round damage of the Bozar is a bit higher than even the sniper rifle’s, and way higher than that of a 5.56mm round shot from the hunting rifle. This means that a 15-round Bozar burst does tremendous damage, and can kill most everything. The stats above partially reflect this with a highballed damage number. The pretext could be that the stable platform and high cyclic rate result in *much* tighter groups than an equivalent burst from an assault rifle. In the first two Fallout games, a Flambé 450 Varmiter. This is a curiously large weapon (way larger than, say, standard World War Two flamethrowers) with a range of but a few metres, though it does massive damage. Once again, making sense of this weapon can be difficult. Our No-Prize Hypothesis is that it was some sort of point-defense weapon used on armoured vehicles. Perhaps there was a scare about the People’s Liberation Army deploying dogs with high explosive harnesses in an anti-tank role, and these were leveraged into funnelling billions into specialized weapons against a threat that never really existed on a large scale. Another possibility is that these are actually repurposed water cannons from riot control vehicles. The low range is because the fuel is much thicker and stickier than water. It’s a simple hypothesis, though it fails to explain the brand name. DCH Flamer [BODY 02, Flame Project: 08, Range (Area of effect 0 APs wide): 01, Ammo: 05, Recommended STR 03, Limitation: Flame Project has No Range (use the listed Range instead), Drawbacks – Very long Reload, MPR (heavy and cumbersome – cutting movement speed by 1 – unless your STR is 1 APs above the Rec. STR]. M&M Flamer [Cone Area 1 flame Damage 7, Limited 1 (5 shots), Quirk (requires a STR of 1 or more, cumbersome unless STR is 2 or more)]. In FO2, an improved version that also uses better fuel can be procured from Algernon , a peculiar gunsmith in New Reno. This increases the EV/Damage Ranks by one. The icon of the Rockwell BigBazooka rocket launcher in the early Fallout games is reminiscent of the 1970s M47 Dragon anti-tank guided rocket launcher (particularly the optics block). However, the in-game model is more reminiscent of a disposable light launcher such as a 66mm LAW. The damage from the rocket also suggests a lighter warhead, even assuming patched-in-game AP rockets. Since the launcher can be reloaded right quick (2 Action Points, like most weapons) we might assume a semi-disposable weapon. The outer tube with the optics block can withstand about 20 launches (and you can unscrew the optics for reuse), and a sealed inner tube housing the rocket and connectors can be simply slid in. In this hypothesis, the inner tube magnetically locks into the outer tube so the weapon can be carried loaded, and the entire inner tube is fired, with the outer parts acting like a sabot. The optics on the icon are large since they are modelled after a missile launcher where the operator guides the missile. But the visuals can reasonably suggest magnification and thermal imaging. With a 66 or 68mm rocket, the Rockwell BigBazooka would be intended to eliminate power armour infantry, lightly-armoured vehicles, obstacles, light fortifications, etc.. In-game it is usually less efficient than a Bozar, but this isn’t reflected in our game stats (which go for something more aligned with how the weapons look). DCH Rocket launcher [BODY 01, Bomb: 04, Projectile Weapons: 09, Sharpness (Projectile weapons): 01, Ammo: 01, Bonus: Projectile weapons and Bomb can be Combined (Bomb rides the Range of Projectile weapons), Drawback: Long Reload] w/Optics pod [BODY 01, Telescopic vision: 03, Thermal vision: 05]. M&M Rocket launcher [Ranged Damage 9, Burst Area Ranged 6, Takedown 1, Armour-Piercing 1, Limited 2 (One-shot)] w/Optics Pod [Senses 2 (Extended Visual, Infravision)]. Writeup last expanded on the 29th of December, 2016.